Samen met Enterprise Europe Network organiseren we tijdens EUROFINISH+MATERIALS een Meet & Match! Ontmoet nieuwe contacten en breid zo snel uw netwerk uit. Direct aanmelden voor de Meet&Match kan via deze link. Get in touch with potential new partners! Meet interesting materials and surface treatment experts, bonding experts, researchers, developers, engineers, SMEs, OEMs, suppliers and intermediaries. In the B2B matchmaking sessions you have 30 minute bilateral meetings with a variety of participants of your choice that are focused on materials. The Eurofinish-Materials Matchmaking 2019 is organized by Enterprise Europe Network. The fairs EUROFINISH and MATERIALS join together as one on the 15th and 16th of May 2019 at the Brabanthal in Leuven (Belgium). During these two days, Eurofinish + Materials 2019 will be the largest meeting point in Western Europe for materials, surface treatment and bonding specialists, researchers, product developers and designers, engineers, chemists, quality managers, testing & measure experts, architects, buyers and so on. Eurofinish + Materials 2019 with its fair, conference and bilateral meetings make it the ideal venue for tailored networking to find solutions for material, surface treatment and bonding challenges and to develop new projects and new business. Why participate in a matchmaking? Many of the potential interesting new connections during an event happen by coincidence both between exhibitor and visitor and also between two visitors. But how can you know which interesting potential partners are walking around on the exhibition floor and the conference? And how can you find out if they might just be looking for someone like you? The B2B Matchmaking sessions offer all visitors, delegations ánd exhibitors the possibility to announce themselves and book other participants. In 30 minutes pre-scheduled meetings you ‘speeddate’ with the other participants to quickly find out what you have in common. Attend the combination of an international fair, the conference program (day 1, day 2) and bilateral meetings. Attend and meet keynote speakers of the conferences. Meet a wide variety of SMEs, OEMs, suppliers and intermediaries. Meet many potential buyers, project or business partners in a short time. Prepare and choose your meetings of preference in advance. If you are not interested in a request for one reason or another, simply decline the request. Register for the B2B matchmaking sessions, via this link and add contact data and your company information (in English) from your website. Important: Describe in your marketplace profile what contacts you are looking for! Book the meetings that you are interested in and accept incoming bookings. 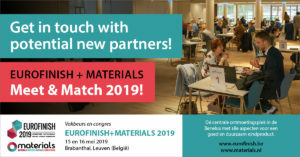 We hope to see you at the Eurofinish + Materials Matchmaking 2019!